The game of football is a war, and going into battle without a strong, dependable front line leads to defeat more times than not. Any good coach, no matter what position he favors or played back in his heyday, will not hesitate to say that games are won and lost in the trenches. An offensive line is not only just there to protect the quarterback, but also to create lanes for the running game. Whether you call them the “Big Uglies”, “Hog Mollies,” or just fat guys in shoulder pads, these hard-nosed young men are the foundation of any dynamic offense. 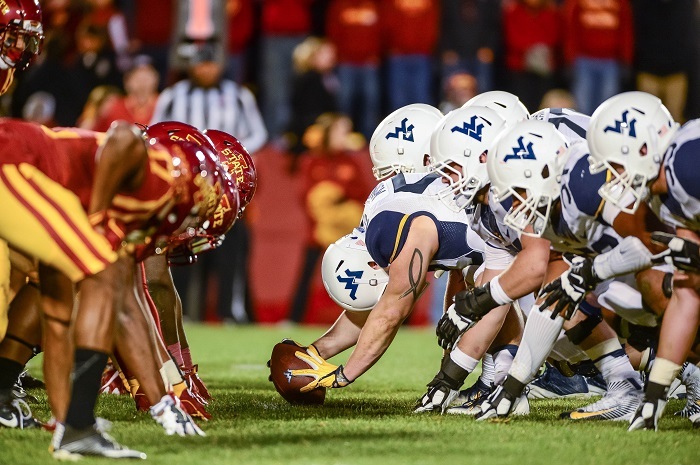 So, as you sit at home or work counting down the days until kickoff, I have countdown of my own for you… Here are, from ten to one, the best offensive lines in the Big 12 Conference. Are you really surprised here? Anchor Hakeem Adeniji leads the offensive line with 24 career starts at left tackle and has been one of the few bright spots up front for the Jayhawks. Meanwhile LG Andru Tovi started 8 games last season at the LG position. The right side is where things get interesting. Luckily with the help of @FitzDaddy85, I was able to get some insight for this wide-open competition on this side of the line. It appears that Kansas will start Houston transfer Alex Fontana at center. Alex missed most of the 2016 and 2017 seasons due to injury, so his health will be key this season. At RG, Chris Hughes will likely return after starting 10 games last season. Lastly, the RT spot may end up going to Ohio State transfer Kevin Feder who didn’t see the field much with the Buckeyes. Beyond these five, look for Dwayne Wallace, Api Mae and Antione Frazier to make a push for playing time as well. 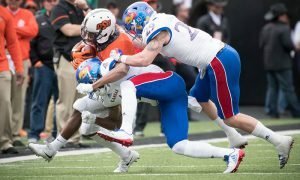 If Kansas wants to finally improve on offense, it all starts up front. It could be likely that there will be a lot of lineup shuffling during the season. Don’t let those 72 combined starts fool you too much here. 50 of those starts come from RG Blake Blackmar and RT Patrick Lawrence. While I trust this right side of the offensive line, there are still some questions about the other spots to the left. Last year Sam Tecklenburg converted from tight end to center and got 12 starts at center in his first year on the offensive line. Meanwhile, Xavier Newman started 8 games as a true freshman last season at LG. Rounding out the group is LT Josh Malin who only started 2 games. Speaking of the LT spot, it appears that Clemson transfer Jake Fruhmorgan could make a push for playing time if Josh isn’t able to hold his spot down. The experience on the right side is great but the rest of the bunch needs to get up to speed. This unit ranked 8th in rushing offense last season in the Big 12 and gave up 37 sacks which was dead last in the conference. Hopefully another season together will help everyone get on the same page up front. TCU heads into the 2018 season losing a ton from that 2017 offensive line that was solid. There is a battle going on at the very important LT position between Anthony McKinney and Austin Myers. McKinney was ranked as the #3 JUCO OT last season by 247 sports while Austin Myers saw limited action last year. At center, redshirt sophomore Kellton Hollins will likely be the guy. Much like the LT spot, RG is wide open with a competition between Casey McDermott and Wes Harris. McDermott played in 6 games last season and Wes Harris redshirted last season but was very highly rated coming out of high school. Luckily for TCU, LG Cordel Iwuagwu and RT Lucas Niang are locks the start at their spots combining for all 24 of the starts up front. While there may be some new faces up front for the Horned Frogs, Offensive line coach Chris Thomsen is a very proven coach who can get the best out of this group. Much like TCU, Oklahoma State loses some key guys from last years group. 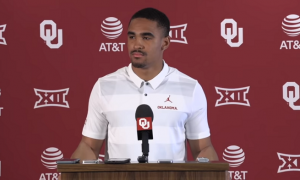 It’s going to be a little tricky for the Pokes up front because they have experience in the interior but there will be two fairly new faces at both tackle spots. LT Arlington Hambright redshirted last season coming out of JUCO the year before while RT Teven Jenkins got 3 starts last season due to some injuries ahead of him on the depth chart. Meanwhile, LG Marcus Keyes has started 26 games and will try to lead the way for this unit. At center, Johnny Wilson looks to lock things down and much like RT Teven Jenkins, he started 3 games last season because of injuries up front. Fortunately for the Cowboys, RG Larry Williams was granted an extra year of eligibility due to injuries over the last 2 years. While there may be some new faces coming into starting roles, opening running lanes for superstar RB Justice Hill will be crucial this season while the offense breaks in a new quarterback. The last couple years, the best offensive lineman on the roster has played LT. That appears to be the case once again since Julian Good-Jones will be sliding over to LT to protect Kyle Kempt’s blindside. However, LG Josh Mueller and C Colin Newell are still very young and unproven up to this point. Mueller saw action in 2 games last year while Newell redshirted. The Cyclones do however have experience on the right side as RG Josh Knipfel started 13 games last season and RT Bryce Meeker started 8. Iowa State hasn’t had much consistency up front the last couple seasons and this year Matt Campbell and company look to break that trend with some of these guys being battle tested already. If Colin Newell and Josh Mueller are the real deal, expect RB David Montgomery to have a monster year on the ground. This unit has some serious potential. Texas is very lucky to have a guy like Calvin Anderson step in as a grad transfer with Connor Williams off to the NFL. Calvin started 36 games at Rice and will likely be one of the best linemen on the Texas roster. Next to him will be Patrick Vahe who has 31 career starts himself but has been inconsistent over the years. Also, center Zach Shackelford has been banged up over the last few years, so his health is always a concern even though he has experience. The right side of the line is where things get shakier. RG Elijah Rodriguez will get the nod, but he is coming off an injury that forced him to miss a lot of the season last year. Rounding out the unit will be RT Derek Kerstetter who was forced into action earlier than expected due to all the injuries last season. 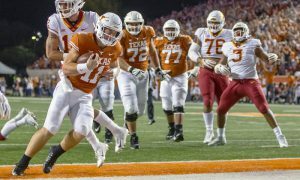 While you may feel good about the starting lineup this season, if one or two of these guys go down, Texas could be in the same mess they were in last season. But, if they stay healthy, they have the potential to move up on this list when the season ends. West Virginia brings back plenty of experience overall as a group. It all starts with LT Yodny Cajuste who was 2nd team All-Big 12 last season and was also on my ballot this season as a 1st teamer. As a redshirt freshman last season, LG Josh Sills started 10 games and looks to take another step forward this year. Now at the center spot it appears that there may be an actual serious competition there between Matt Jones (Started 13 games in 2017) and redshirt sophomore Jacob Buccigrossi. I am not sure who will win that, but West Virginia likely feels comfortable with either guy there. The rookie of the group will be RG Isaiah Hardy who didn’t start last season but did see some game action. Finally, is RT Colton McKivitz who has started 23 games for the Mountaineers and looks to have another solid season. I feel like this is a very under the radar group in the Big 12 and with an already high-flying offense, this is just icing on the cake. For the first time in years, I feel comfortable about the Texas Tech offensive line. Last season this group was very young for the most part and now all of them are considered veterans in my book. This unit returns all five starters which is good and should help continue to build continuity. LT Travis Bruffy was thrown into action last season and played well. Look for him to have a big year this season and the same for LG Madison Akamnonu. 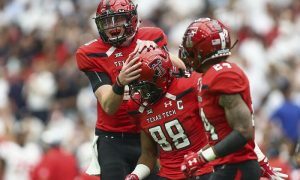 At center, redshirt senior Paul Stawarz will play his final season in a Texas Tech uniform with plenty of game experience having started 21 straight games. I saved maybe the best for last with the right side of the line in RG Jack Anderson and RT Terrence Steele. Jack Anderson started 13 games as a true freshman last season and could very well end up as an all-conference player by the end of the year. Meanwhile, RT Terrence Steele has the most starts out of any offensive lineman at Texas Tech with 25 career starts. If you’re a Texas Tech fan, you should be excited because this group should help break in a new quarterback not only in pass protection but opening some running lanes up front to take some of the pressure off the quarterback whoever it may be. Speaking of experience, this lineup has a combined 112 starts! I know some Kansas State fans are probably saying we should be number one on this list! Look, it was very close for me but if it makes you feel any better, consider Kansas State not a true number two on this list. Consider them of more of a 1-B instead. LT Scott Frantz is a veteran who has done nothing but protect his quarterbacks’ blindside during his 26 career starts. Another guy you shouldn’t sleep on is LG Abdul Beecham who like a lot of others in this unit, could be an all-conference player at the end of the season. The guy with the least experience is C Adam Holtorf but I wouldn’t make too much of a deal out of that because he started all 13 games last season at center. Throw in RG Tyler Mitchell and this is an outstanding group. 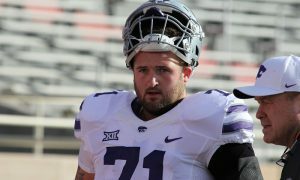 Wait, how can I possibly forget about the two-time first team All-Big 12 selection Dalton Risner who has 38 career starts and may be the best offensive lineman in the entire conference. In fact, he probably is. 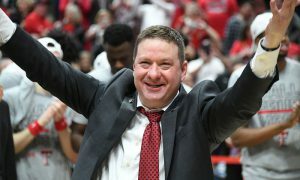 Overall, you must love this group from an experience standpoint and this could be one of the main reasons the Wildcats are in possible conference title contention. 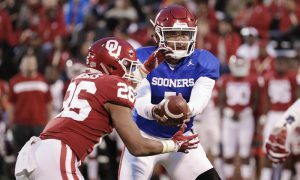 While this may be a surprise to some over Kansas State, Oklahoma has studs up front that very few teams have in the country. 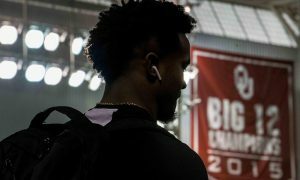 Bobby Evans, who is one of the best linemen in the Big 12 will slide over to LT and will likely be an All-Big 12 selection once again. Next to him is the man with a mean streak, Ben Powers who has started 22 straight games himself. At center, there is an interesting position battle going on between redshirt freshman Creed Humphrey and redshirt senior Jonathan Alvarez. Both guys can play well but I would likely give the nod to Humphrey who was a very highly touted player coming out of high school. No matter who starts at center, RG Dru Samia has the most game experience out of anyone with 34 career starts. Rounding out the unit will be RT Cody Ford who started 7 games last season and looks to have a big year cracking the starting lineup full time. Like I mentioned earlier, not only is this group the best offensive line in the Big 12 but it is one of the best in the entire country.